professional workflow classes from established producers. In the FL Studio Edition of our Producer Clinics, Tim Alkemade from Dread Pitt will give you a brief beginners course, where you will practice applying music theory and arrangements in your workflow. You will also learn industry standard mixing techniques to start making commercial projects! 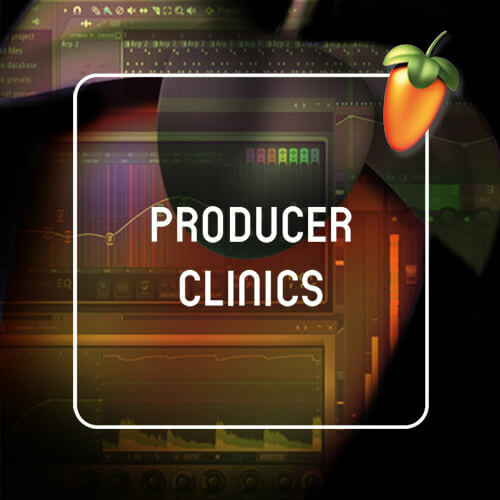 After the clinics, you’ll be able to create, arrange and mix your own tracks in FL Studio. Knowing your DAW is the first step to creating a solid workflow. Shortcuts, placing sounds in the mixer and using external VST’s, all you need to get off to a good start. You will also be taught in basic music theory: how does voicing in chords work? Which arrangements, chords progressions and sounds work best for your style of music? After these classes you will get homework assignments to apply, what you have learned, to your own projects. Before one starts building a house, one first has to start with the foundation. The same principle applies to music production: What is sound really? How do our ears work? How does sound manifest itself? What are the characteristics of sound? During this stage we discuss the essential tools that are needed to edit sound. When you turn on a switch, you will know what the actual effect is. So you got your workflow in order and can apply mixing techniques to your projects, now what? In stage 3, you will learn the usage of synthesizers, drums and effects like distortion, delay’s and filters. You will understand how to create your own sound with synths, play with grooves in your tracks and apply advanced effects to improve your overall sound. After the Course you will be able to create and mix dynamic tracks with FL Studio, having all the essential tools to further create your own clean sound in a solid workflow. The study load for this Course is 6 hours per week. The study load can vary per student and includes the hours of lessons to be followed at our school. During a free intake you can ask our teachers for more information about the study load and further content of this Course! The Producer Clinics start in March, June, September and November. When you are registering for the Producer Clinics, please let us know for which starting date you are signing up for. It is also possible to follow the Producer Clinics as private lessons. For €60,- per hour, you can decide your own pace and number of lessons. Extra discount options are possible if you follow a private course with a friend. Ask us for the conditions! Besides the regular Producer Clinics, Tim also hosts several FL Studio workshops during the year. Please sign up for our newsletter or contact us to be the first to know about the next one! Do you want to meet the teacher before signing up for the Producer Clinics? Discussing your learning goals and music in a free intake is possible throughout the year.